He had been known for prophecies of gloom and doom for many, many years, and he had been given to extravagant outbursts lots of times before. He had visions, heard voices, broke pottery, wore yokes, and he became known as “The Weeping Prophet.” As we have seen the last few weeks, the word of the Lord that came through Jeremiah was often a difficult word that sounded harsh as it stung it hearers’ ears. Perhaps you’ve known people like this. The uncle at family reunions who always seems to have bad news to share, or the co-worker you never ask “How are you doing” because you know the answer will include long lists of difficulties. Had there been parties at this time, Jeremiah would not have been on the guest list. People knew his song, and they were getting tired of One-Note Jerry. But this was no time for parties. Things were grim, and the situation was dire. Indeed, this was as bad as these people had lived through, and things were getting even worse. As Jeremiah chapter 32 begins, the southern kingdom of Judah was breathing its last, and Jerusalem was under siege. King Zedekiah of Judah had rebelled against Babylon, and the Babylonians were punishing the king and his people. The Temple would be destroyed, the capital, Jerusalem, would be laid waste, and the entire nation would be annihilated. Times were desperate. And, what had Jeremiah done? Jeremiah had told the king that his kingdom would be toppled, that he would be punished so much that he would be taken into captivity into Babylon. And what had King Zedekiah done? He had thrown Jeremiah into prison. What king, after all, needed a loud-mouth prophet spreading words about his pending demise, especially when the enemy army was advancing? So, even if there had been a party, which there surely would not have been, and even if Jeremiah had been invited, which he surely would not have been, the prophet could not have attended, at that time, because he was in jail. So, do you get the scene? A nation in tatters, a king about to be toppled, land that is being overtaken by the enemy, people about to be hauled off into exile, and God’s prophet in jail. It is gloom and doom, indeed! If ever Jeremiah could have said “I told you so,” this is the time. But, notice what he did. He bought land. The Weeping Prophet became the Cash Buyer. Jeremiah gathered money and spent it all on a real-estate deal with his cousin. What could he have been thinking? Here’s the scene: Jeremiah’s cousin, Hanamel, came to him and asked the prophet to purchase the family’s land in Anathoth, which was a few miles outside Jerusalem and already overtaken by the enemy army. Surely, this would have been another great object lesson for the prophet to show the people how they missed the mark. He could have said, “God’s wrath is coming on this people, and you ask me to purchase land? Put your faith in God, not in land, and pray to God to sustain you even as the land is laid waste, and you are taken away.” This would have been right in line with Jeremiah’s prophetic work. But, he does nothing of that sort. He bought the field, a field that was virtually worthless, and he conducted his business publicly in full view of many Judeans. He counted out the money, transferred the deed of purchase, and had his associate Baruch put the documents in earthenware jars, the safety deposit boxes of the day, for safekeeping “for a long time.” Remember this was the gloom-and-doom prophet, the fellow who had been warning these people for years. And, just as the people were about to lose it all – literally – he purchased land and demonstrated hope in the future: a future that was unseen, unknown, and beyond anything that Jeremiah could imagine or hope to live into. What an act of bold faith! Remember, land was very important to Jeremiah and his contemporaries. 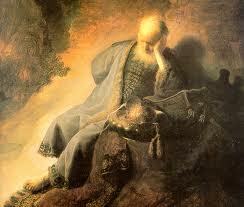 Jeremiah was among people whose ancestors had known slavery in Egypt and landlessness in the Exodus. They received land as evidence of God’s grace and God’s provision for them. Land was so important to them that it could not be bought and sold simply and easily as a means of profit. Instead, land was cherished and prized. There were no flippers who bought low and sold high for a quick profit. We do not know why Jeremiah’s cousin, Hanamel, wanted to sell the land, but there was a good chance that, living outside the capital city of Jerusalem, he had seen the enemy come through the countryside on the way to the capital, and he had witnessed the destruction and coming defeat. Perhaps he wanted to get any money he could to help him flee and relocate, and maybe he thought cousin Jerry might just be wild enough to go for it. So, he came to his cousin with the offer to sell. And, Jeremiah said, “Yes!” Jeremiah – the old man, the tired prophet in jail, the aged one who believed his people would be taken into captivity and who was aware of reality enough to know that he, Jeremiah, would not likely live to enjoy the land – agreed to purchase it. He took his own money, and he invested it in the future, God’s future, that he believed would come to pass someday, somehow. Let’s be honest. There really was nothing in this deal for Jeremiah. He was purchasing a parcel of land that was nearly worthless and was losing value with each advance of the enemy army. And, even if the miraculous happened, and the people were returned to their land someday, somehow, Jeremiah would not benefit. He would not walk around the land and enjoy its vistas. He would not farm the land and sell its produce. He was purchasing land for an unseen future, staking his claim in a God whose faithfulness would transcend the destruction all around him in the present. What a bold faith! And, as was his pattern, Jeremiah recognized that there was a lesson to be taught here. So, he completed the deal in public – in full view of everyone who would watch – so they would see that the gloom-and-doom prophet was staking his belief in the future when land would be valuable again, when someone would enjoy the vistas, when others would farm the land and enjoy its produce. Jeremiah was putting his money where his heart was, believing that God’s grace and provision would accompany the people in defeat, to exile, through exile, and all the way back home again. And, Jeremiah offered this purchase as a means of encouragement to his fellows. This one-note Jerry began singing a different tune with a hopeful chorus of a future, yet unseen, when God’s care and provision would bring the people back home. That is bold faith, putting his money where his heart was! In Jeremiah’s actions, we see a linking of faith in God with the everyday realities of life. Jeremiah’s prophecy of hope was not uttered in words alone, even beautiful, poetic, or inspiring words. Rather, Jeremiah the prophet took money, real money that had to be earned and saved, to buy land, real land that was under attack, real attack by a strong enemy. We see, again and again, that God uses the everyday realities and necessities of lives to show God’s care and to lead God’s people. And, I believe that God calls us to use the everyday realities of life to show our commitment to follow in God’s way and to care for others. Biblical faith does not separate everyday realities from faithful living. So often, we discount everyday things – money, investments, houses, cars, toys – as carnal and material, things somehow less than other spiritual things. We tend to separate the material from the spiritual, claiming to value the spiritual more highly as of ultimate importance. Yet, in a fascinating twist, despite our convictions to the contrary, we keep our attention on material things, and the pursuit of acquiring and securing them can become our focus. We may look to the future as Jeremiah did, but we tend to see 401(k)s and investments that we build to provide for our own security and our own benefit. Even as we believe God looks on the heart and cares about our loving motives and eternal commitments, we spend our time and attention on money, investments, houses, cars, and toys. Jeremiah’s object lesson in spending real money reminds us that God calls us to use real money in support of good causes and worthy endeavors in ways that seek to unite the spiritual and material in faithful living. Do you remember reading the teachings and parables of Jesus? Notice how many times Jesus talks about money and the ways in which its use demonstrates people’s ultimate commitments. When Jesus talks about money, it is real money not bunches of Monopoly money that is fake and unlimited. It is money that you and I have worked for and earned. And, what we do with it – as individuals, as families, and as a church – demonstrates to a large measure how we follow the God in Jesus Christ. When Jeremiah spends his real money to purchase the field in Anathoth, we see another important lesson. Faithful living calls us to link future hope and present action. What we believe to be ultimately true in the future should guide how we live today. Jeremiah’s hope was a future hope, far beyond his day, to a time when God’s provision would bring the people back from exile. Despite its distance into the future, Jeremiah’s hope caused him to spend his real money in the present and to entrust his money to a God who would use it in ways that would be good and right – beyond anything he could hope to see or enjoy. That is bold faith, putting your money where your heart is! There are examples in our day. I was pleased to know one such person. Al Wilson spent his working years as a successful businessperson. He worked hard, and his businesses prospered. He believed that God called him to share with others, and Al and his family spent time and money in support of their local church and its broader ministries. He came to believe that forming effective ministers was a worthy endeavor, and he supported a theological school by giving substantial sums of money, serving on its board, and asking other people to give their money and time as well. When Al and his wife, Carol, no longer needed their large home, he decided to downsize and give the proceeds of the sale to the theological school so that it could be used to form effective ministers for the future – a future that he would not experience himself, but a future that God would bring about for others who followed him in Christian faith. That is future hope that brought forth bold action in the present. In 2004, before Hurricane Katrina came ashore, Christian women and men in New Orleans became concerned about providing adequate housing for others in the city’s Ninth Ward. First Baptist Church of New Orleans partnered with Habitat for Humanity to create the Baptist Crossroads Project, agreeing to build forty homes – with real money and real labor – for other people. They invested in a future they could not see, and they committed themselves to provide hope for others. They would not live in the houses they would provide, but thanks to their faithfulness, others’ futures would be improved. And, following Hurricane Katrina’s devastation in 2005, the Baptist Crossroads Project expanded its vision ten-fold, striving to build 400 houses in flood-ravaged New Orleans. That is future hope calling forth bold and faithful action in the present. Like Jeremiah, these faithful followers of Jesus put their real money where their hearts are, and their bold faith is making a brighter future possible for others. The good news for us is that the God of Jeremiah is our God, too. And the faith that propelled Jeremiah to take the extravagant step of plunking down his own money for a future that others would enjoy can be our faith as well. May we be open to the opportunities before us this day to be so bold and so faithful. Amen. This entry was posted in Sermons, Uncategorized on January 21, 2013 by Dean Allen. We are near the beginning of 2013, and I’m wondering if you made any New Year’s resolutions. Pollsters tell us that half of Americans make resolutions at the beginning of each year, and most of the resolutions have to do with personal patterns such as eating healthier and exercising more. Some people set goals for stopping a negative habit or starting something to improve their lives. I have decided that I want to be a better, more careful, and more caring listener. When someone is speaking to me, I want to listen to what she or he says. And, then, I want to wait at least a second before replying. My hope is that, rather than preparing for my reply while someone else is still talking, I will listen fully to what she is saying. Then, by waiting before I speak, I will respond in ways that are more supportive and helpful. As the year goes along, you are welcome to ask me how this is going – and see if I listen carefully to your question! Most resolutions are personal in nature and may be accomplished with little involvement from others. What if we tried something different this year? What if we thought of communal resolutions for the new year. Rather than focusing solely on what I want to accomplish all by myself, what if I reflected on a group of which I am a part? Then, perhaps I could think of ways the group could resolve to do something together in the coming year. For example, think of a group in which you participate such as a Sunday School class, a book club, or a neighborhood association. As you envision this group in 2013, are there activities you would like the group to do together? Are there goals you would like to accomplish together? Can you imagine yourself at the end of this year looking back on what took place? As you consider the end of 2013, are there things that will make you pleased to have been a part of the group throughout the year. If you have ideas, suggestions, or feedback about communal resolutions for the new year, I invite you share them. You may send an e-mail message to Dean@FernwoodChurch.org. This entry was posted in Uncategorized on January 7, 2013 by Dean Allen.